Movie Review: Powerful, drastically visceral, and relentlessly tense, is how “Kajaki”, the first fictional feature length from Paul Katis, who also co-produces, can be described. 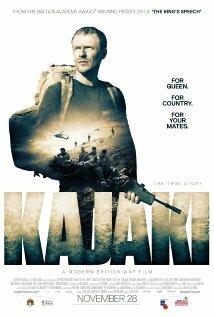 Written by Tom Williams, the plot was based on the true story of Mark Wright, a British soldier who died near the Kajaki dam, located in Afghanistan’s Helmand province, in 2006, after stepping on a mine when he was trying to help harmed soldiers of his small unit. Despite the inspiration for the film has come from Wright, played by David Elliot, the main character here is the platoon’s brave medic, Paul ‘Tug’ Hartley, magnificently embodied by Mark Stanley. The soldiers were sent to a top hill observation post with a view of the dried dam, which revealed to be a treacherous minefield. We have to wait 28 minutes for the first raw scene that opens the hostilities with these occult enemies, silently waiting for someone to activate them and cause destruction. A few days after watching this shocker, several images are still engraved on my mind. The viewers shall be prepared to deal with agonizing frames whose realism conveys the human suffering, frustration, and despair, in a very impressive way. I utterly jumped from my seat at every burst, taken by surprise and completely appalled by the flesh-and-blood that get completely out of control when the morphine is not enough to produce the desirable effects, and when the helicopter that should aid them is not really helping at all, triggering even more tension and consternation. With mutilated young men lying on the ground, in panic, I wanted to cry with them. My indignation increased when, at the end, we are informed about the medals of honor given to these men – what do these medals mean, if these damn wars and operations can make you handicapped for the rest of your life, if not dead? “Kajaki” hits you bluntly, causing turbulent emotional reactions.